The Dempster Highway connects Dawson City with the communities of Tsiigehtchic, Fort McPherson and Inuvik in the Northwest Territories. Inuvik is set in the midst of the huge Mackenzie River Delta which empties into the Arctic Ocean and from here visitors can travel by boat or plane to other communities in the Western Arctic region including Aklavik, Paulatuk, Tuktoyaktuk and Sachs Harbour. 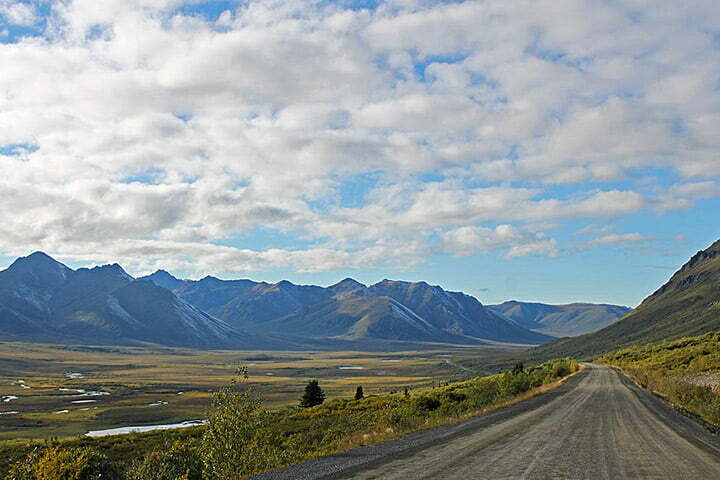 Breathtaking scenery and northern wildlife make a trip up the Dempster Highway an experience of a lifetime. The incredible variety of terrain, flora and fauna makes this drive one of the most unique in North America. Its increasing popularity is a testimony to the beauty of the countryside through which the Dempster runs. There are many points of interest, the highlight of which is at km 403 where the Dempster crosses the Arctic Circle. The highway is open year-round except for short periods during spring thaw and fall freeze-up. Ferries at the Peel and Mackenzie rivers will take you across free of charge from June to October. In winter, ice bridges allow traffic to cross. Well-maintained campsites and roadside services are strategically placed along the length of this 747 km (450 mile) gravel highway. At km 371 (mile 231), the Eagle Plains Hotel provides food, accommodation and a service station to travellers. The communities of Fort McPherson and Arctic Red River also offer a number of essential services. Take the time to visit the Western Arctic Visitors’ Information Centre located in the British Yukon Navigation Building on Front Street in Dawson City. The centre can provide valuable information about the sights and attractions along the highway and in the Western Arctic region. Road condition reports are also available and it is prudent to check these before departing Dawson City. Look for the polar bear marking the location of the Western Arctic Information Centre on the Dawson City Map- Attraction & Service Guide!